Approximately 6% of college undergrads have a physical disability, according to US Census Bureau data from 2010. When physically disabled high school students are looking for a college, they need to do some homework and start well in advance, certainly during Junior year and possibly during sophomore. There are many services that colleges can offer, and if you are able to visit a college campus, you can see firsthand how extensive the support and inclusion services are. 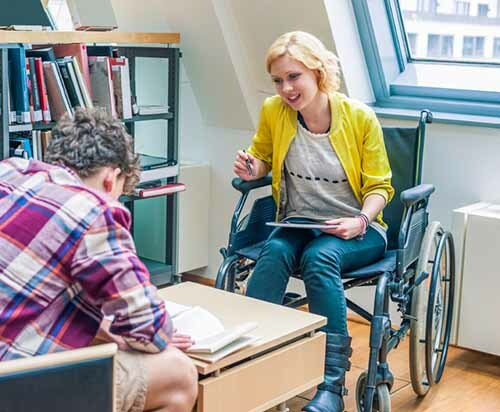 One important stop on a campus visit would be the Office of Disability Services; it may have a different name on each campus, but you need to locate the office to make sure there is one. Be sure to be honest about your needs, so that you can be sure the college can and will meet them. You don’t want to go to a college where they are not able to support you as you need. Schools can offer a wide variety of services, and be sure to examine the full list of offerings when you visit, research or call. Make a list of what you really need, and then track which colleges have most of your needs. In this way you can make a great placement. Don’t forget to make sure the college offers two majors that interest you! Be sure that all of the schools on your final college list offer exactly what you will need to be academically successful. And finally, a great book to check out on this topic is College Success for Students with Disabilities, written by mother-son team Chris and Tom Tiedemann. The Tiedemann’s book lists 70 colleges that are excellent at serving physically challenged students. Do your research and set yourself up for success. Yay, college!